For coffee lovers, many brands produce a lot of home appliances from simple coffee makers to automatic coffee machines. However, unique devices such as Nespresso machine (or capsule coffee machines) deserve special attention. That's why I decided to write this ultimate guide for the best Nespresso machine reviews. Capsule coffee maker is an ideal solution for those who want to spend the minimum possible time servicing the device, but at the same time indulge themselves with different coffees. Perhaps the main difference between such a machine and its counterparts is the ability to easily prepare the first cup of one flavour, and the second cup of a different flavour almost instantly! Nespresso provides the highest level of customer service. It takes into account the specifics of the range of consumers, the estimated consumption of coffee, the place of installation of the machine, and much more. Below, you may check some Nespresso machine reviews for the best models available on the market today. Nespresso Essenza Mini is small in size, very compact, takes up very little space, just handy if the kitchen space is limited which I really like. For the ones who are not particularly friendly with technology, it will be a huge plus that there are only two buttons on the machine on both sides; it is definitely not a bad thing, and in any case, the coffee will be brewed. On the buttons, there are pictures: on one, small cup (espresso), on the other, cup (espresso lungo). There is no much difference between these modes - only the size of the cup. It is also very convenient to have a quite big water tank compared to the size of the machine; it's about 20 ounces (0.6 L). Moreover, it is transparent, which allows you to control the volume of water. The tank has flip top lid so that you can fill the reservoir very easily. You can detach it as well to fill but some people have complained that water leaks from the bottom. However, I think it's probably because they didn't put on quite right. You just need to make sure it's securely in place and sort of locked in the back. The operation of the machine could not be simpler; you open the lever on top and you drop your Nespresso pod. The machine box includes a sample pack of capsules; some are for espresso shots, others are for lungo shots, and there are some that can be used either way. An espresso shot is a little less than 2 ounces and a lungo is going to be more like 5 ounces. The capsules are made of aluminium which is recyclable, unlike plastic, if you are crazy like me about environmental issues. One little feature that I enjoy is the ability to remove the drip tray where you put the espresso cup and use any other cup instead. This Nespresso machine is also fairly quite in operation. One of the cons of this device is that it keeps dripping for a while so you should wait few seconds before taking away your cup. Another one is that the capsules are quite pricey at about 70 cents per pod. If you do not like to clean up the mess after the standard coffee machines, I believe this small and compact coffee maker is just for you. Actually, this coffee maker does not differ from Essenza by Breville much. However, if you would like something more bright, smooth and shiny as an accent in your kitchen interior design, you should choose this coffee maker by De’Longhi. It has bright yellow and red variants as well as the classic black one. So, if you are after modern designs, I'm sure you will love the aesthetics of this little machine. 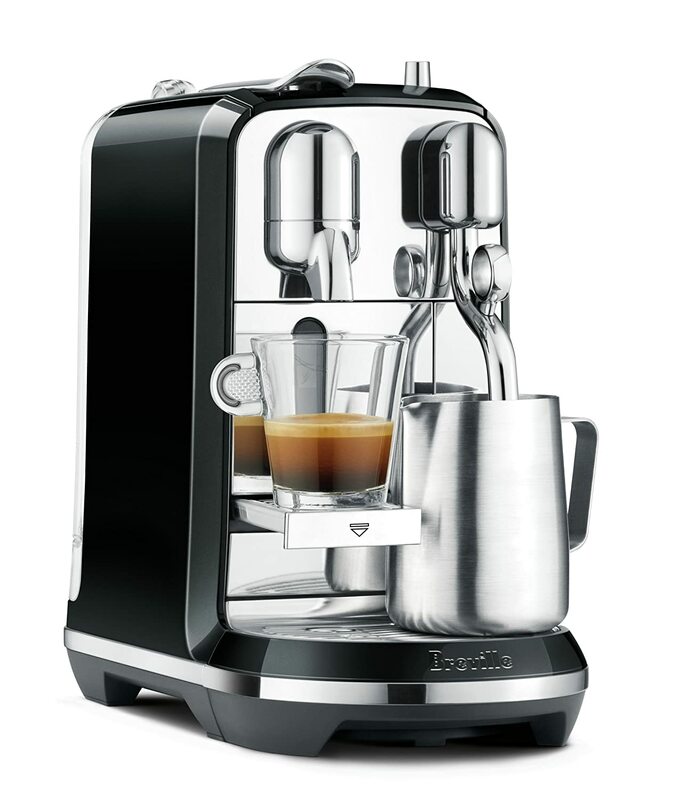 Like the previous machine by Breville, this one comes with the same sample pack of Nespresso capsules. It has a container that holds up to 6 capsules so you don't have to empty it often. It has a detachable drip tray as well. The size of the water tank is 0.6 Litre. The operation of this machine is almost identical to the other Nespresso machines and it takes just about 25 seconds to warm up before brewing the coffee. The machine would turn off automatically after the job is done but you can do it manually by pressing both buttons (espresso and lungo) simultaneously. Moreover, you can stop the coffee flow by pressing the same button again. Like the Breville model, you can program different water volumes and change the auto off mode from 9 minutes to half an hour. The Nespresso Essenza Mini perfectly meets requirements of even picky consumers, who prefer espresso over dripping coffee. 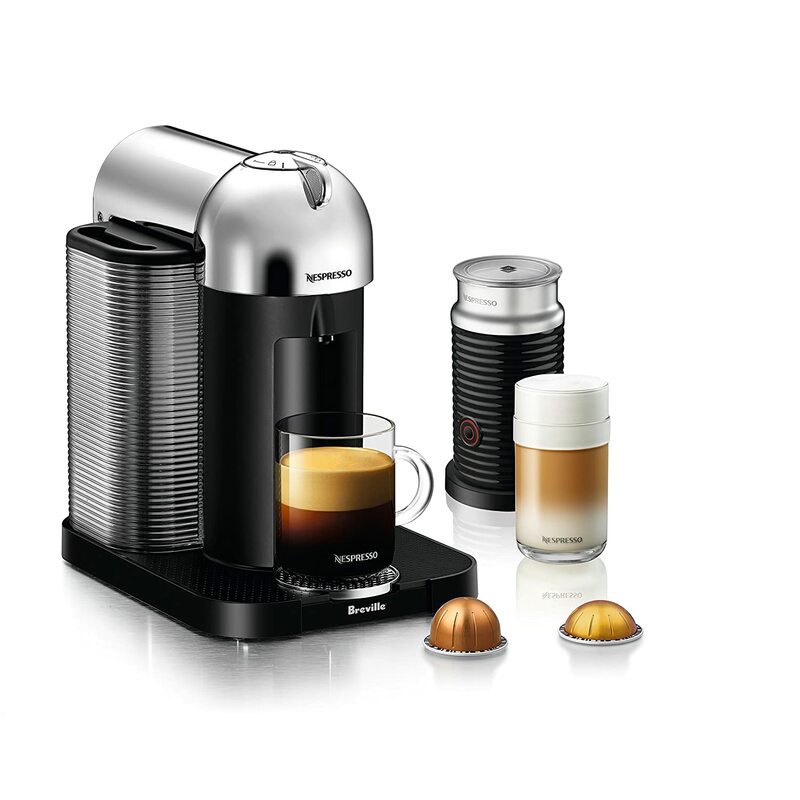 This best Nespresso machine makes a strong and flavourful espresso with a heavenly smell. With minimum effort you get a cup of coffee you can dream of just pressing one button. Without any doubts, it looks great with the same built quality and coffee standards as the other Nespresso machines at a very reasonable price tag. The only drawbacks I can think of is that the compact measurements of the machine results in a smaller water tank and a smaller capsules container. So if you are drinking a lot of coffee, you have to fill water and empty the container more frequently. Personally, I prefer tall glasses which requires me to remove the drip tray. Nevertheless, some glasses are too long to fit beneath the coffee outlet so you would have to place the machine on a higher surface to solve this issue. 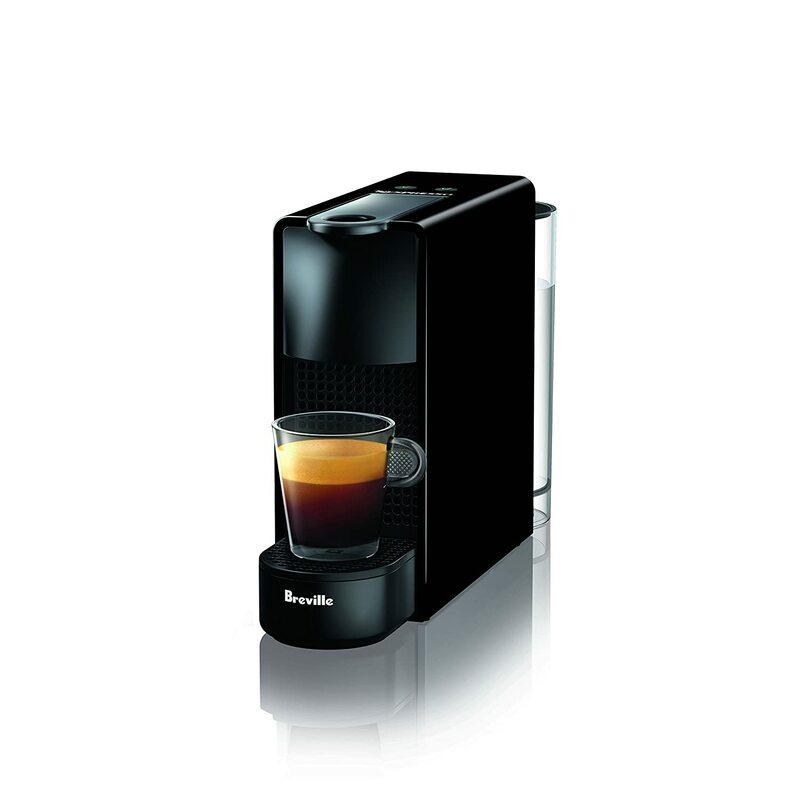 The barista style coffee experience is now even more achievable at home, thanks to the launch of Creatista. This is the first Nespresso machine that allows users to choose their preferred milk texture and temperature, to create silky and smooth milk and latte art! Due to this unique feature, I decided to short list this espresso machine to my top espresso machine reviews. At first glance, this machine features premium high gloss exteriors with commercially inspired rounded edges and polished chrome details. This makes it a perfect addition to any kitchen bench top. The machine allows users to easily and conveniently create everything from a creamy cappuccino through to a velvety smooth flat white or even a latte. You can further top that with a beautiful milk foam design. The machine comes equipped with an intuitive menu of five move based recipes to easily select from. It also includes options for different milk foam textures and temperatures so that coffee drinkers can customize to match their preferences. Creatista makes it simple to create a personalized coffee; after selecting your preferred coffee style via the digital interface, the user simply needs to fill the provided jug with milk and place it on the temperature sensor. The milk is then automatically heated to the ideal temperature while the steam wand frosted to the perfect texture required for the coffee selected, hands-free. The steam wand features auto purge for fast and easy cleaning. If you are not entirely sure how to make a perfect coffee, the onboard interactive display offers step-by-step assistance for coffee personalization and maintenance. This machine features fast heat up for when you need that coffee fix in a hurry. It features auto power off after 10 minutes of non-use to save on your energy bills. Making coffee and operating the machine itself is more than simple. You just need to pour water into the water tank, plug the machine in, throw the K-cup into a special compartment and press the button. It has just two buttons for a classic espresso and a double espresso. The difference is in volume. 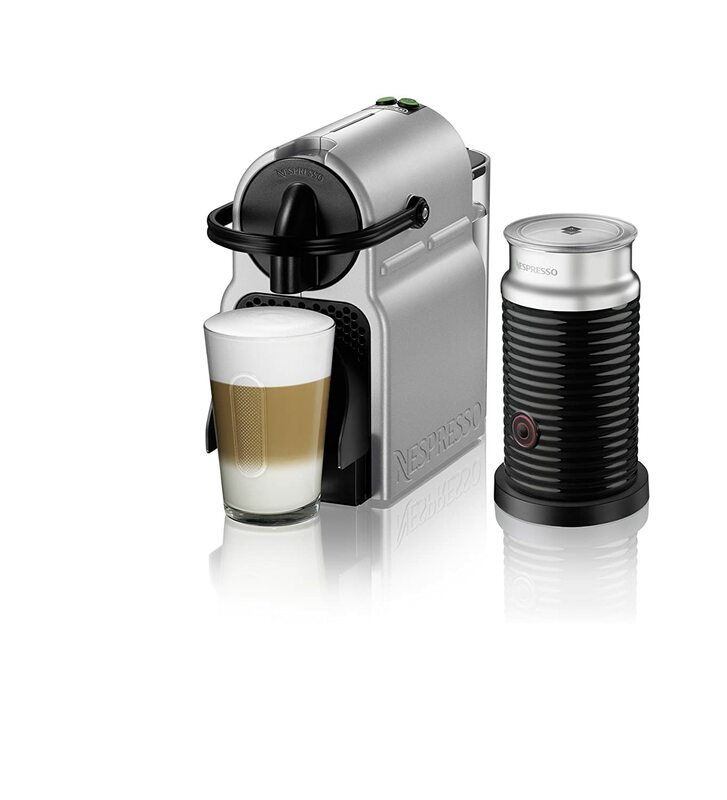 This Nespresso Inissia comes with the Aeroccino included, which can be used and stored separately. In half a minute it will make you a thick froth for your cappuccino. This Nespresso machine review is one of my preferred because of the included frother. This machine has a 19 bar pressure pump, it doesn't make regular coffee. The box includes a sample of 16 Nespresso capsules with different flavors. The machine is sleek, compact, and takes very little counter space. It's available in black, silver, titan, and red and the housing is plastic. The package includes a nice folder with information about Nespresso and a coffee menu describing each coffee capsule. The operation of this machine is similar to other Nespresso coffee makers (especially the previous model) with only two buttons that blink while the unit is preheating. Once the flashing stops, it means the unit is ready to use. This usually takes about 25 seconds which is pretty fast. The water tank size is about 24 Ounces. The lungo should give you about 3.7 Ounces of coffee and the espresso about 1.4 Ounces. You can customize the cup size by pressing and holding down the button until your cup is filled to the size you want. The machine will use that size in the future for brewing. The included Aeroccino Milk frother is automatic. It's a great addon to your espresso to make cappuccinos, lattes, and macchiatos. The instruction manual has a few recipes. This frother comes with two whisks, a circular one for hot and cold milk froth, and a smaller one for hot milk. The machine shuts itself off after 9 minutes of inactivity but in case you want to switch it off right away, just press the 2 buttons simultaneously. I recommend to descale the unit once a year using Nespresso's descaling solution and NOT using vinegar. One feature I really love about this product is that if you are confused by the price of the capsules or do not like their taste, you can purchase empty capsules, put ground coffee there yourself, and thus make your favorite coffee. That's a huge plus to this device. The espresso produced from this machine smells and looks really good with a decent amount of crema. A con of this machine is that it's very loud so you shouldn't run it if someone is sleeping close by but it's literally a few seconds, so it's not a big deal. Nespresso has really raised the bar with this machine, I have to say. It has a built-in frother, makes a great espresso, and is very fast and easy to operate. There's plenty to talk about in this machine so let's just dive in this Nespresso machine review and checkout this awesome new single serve espresso machine. The box comes with the machine itself, a starter pack of Nespresso capsules with different flavors (chocolate, vanilla, citrus, etc...), "my machine" manual, and a nice binder to store this manual and other info about Nespresso. Unlike previous models, there are 4 buttons on this machine; two buttons that we are used to (lungo & espresso) and two macchiato buttons (cappuccino & latte) which will be glowing when you have the milk container connected to the machine. There is a top lever that exposes the brew spigot when lifted up so that you drop the capsule and go. The design of Nespresso Lattissima is beautiful and stylish, besides it fits perfectly into any type of kitchen. It has a 30 ounces water tank that's larger than many other Nespresso machines I have seen. One disadvantage is that it does not have an option for a water filter so you should use filtered water or distilled water in order to cut down the limescale and get the best flavor out of your coffee. The other liquid container is the milk container which is totally new to the Nespresso line. The container should be filled to the max line mark to avoid spilled milk. The frother can be adjusted to the level of foam that you want using a knob, which I really like. There is also a clean button to easily clean the container after use. The machine just amazes me because it moves on very quickly and gets the job done just in time which is wonderful for being a single serve espresso machine. The layering is really cool if you are going after a macchiato; you have your milk foam, crema, and nice layering down to your cappuccino at about 160 degrees Fahrenheit. The machine does not work too loudly, however, you cannot say it works silently though. Sometimes the machine needs to be cleaned - you will understand this when one of the buttons turns on orange rather than white. The milk frother requires constant care which can be done easily as all the parts of the milk container and the milk frother can be easily removed and washed. There is a descaling spout stored in the tray beneath the milk container so it's available right inside the machine when you need it. Regarding price, this machine is more expensive than the other machines I reviewed but for the speed and the features, I believe it's worth it. If you want something that's one-stop shop, go for this machine. If you love superior quality espresso, cappuccino, and latte macchiato and want them super quick, this machine delivers! That's why I chose to include it in my Nespresso machine reviews guide. This machine packs a lot of power into an incredibly small package; it's about the size of a toaster and couldn't be any easier to use. This machine makes six drinks at the touch of a button in three coffee sizes unlike the previous models that make only 2 sizes. De'Longhi makes a number of similar machines with Lattissima Pro being the top of the line. It incorporates a lot of metal in its construction making it very solid. This coffee maker got a language touchscreen display not found in previous models . It has a large 43 Ounces water capacity in a rear-mounted tank which can be filled at the machine or removed and filled at the sink. This machine operates very similar to the others and if you are in a hurry, you will like this machine because it's ready to brew in seconds; from cold start to a finished cup, less than a minute. It's one of the fastest machines I have come across. The used Nespresso capsules bin holds up to 15 capsules, higher than all the previous models. On the coffee side of the machine, there is clearance for coffee mugs and tall latte glasses and a flip-out tray for shorter espresso cups. So, you don't have to remove the bottom tray to use long glasses. With one click you can get either a simple espresso or a magnificent lungo with coffee foam, as in the best coffee houses in Europe. You can adjust the density of the milk foam with the dial on top. One feature that I really enjoy in the milk system is that when you turn the dial to the right, it automatically cleans the milk system. Moreover, all the components of the container are dishwasher safe. There is a hot water spout that's stored in the back of the machine which attaches to the side of the machine which is really nice. Nespresso Lattissima is easy to maintain, or rather it maintains itself, you just have to follow what it says on the display. Another advantage is that every time you can put a capsule with a different taste (there are about 16 different tastes included). Tastes range from classic ones to exclusive series like strudel or menthol. The disadvantages include only a relatively small volume of the water tank (water is spent not only on making coffee but also on the subsequent washing of the milk system). For one person, the volume of water is quite sufficient, but a large family will have to fill the tank constantly. Nespresso Pixie is one of my favorite single serve coffee making machines; in this case, a single serve espresso making machine. The Pixie lives up to its name considering how small it is. This is something I love about this machine, its size. It takes literally almost no room on your countertop yet it does a great job at brewing some awesome espresso. That's why it qualifies to be in this Nespresso machine reviews guide. The water tank attaches to the back of the machine like what we have got used to by now. When the tank is empty, a red light comes on in order to inform you of the need to fill it. There is no filter in this tank so you probably want to use filtered water with your Nespresso Pixie. Like other machines, it has modes, one for espresso and the other for lungo. One thing that's very much worth mentioning on this machine is that it got a 19 bar pressure pump. 19 bar is actually well above the required standard for an espresso machine to be able to brew espresso. So, this machine meets and exceeds the amount of pressure that it is supposed to have to do a proper shot of espresso. The tray that the cup is placed on is foldable like what we have seen so far. The container used to store the consumed capsules is attached to this tray, not separate. 16 different Nespresso capsules are included as a sample; all of which vary in the strength and the taste of the espresso. When you try the samples and find the taste(s) that you really love, you can buy a pack of that specific blend(s). The machine is not as loud as the average espresso machine that I have seen running in most coffee shops. Nevertheless, it produces a great pull of espresso in under 30 seconds with an awesome layer of crema. It tastes really great! 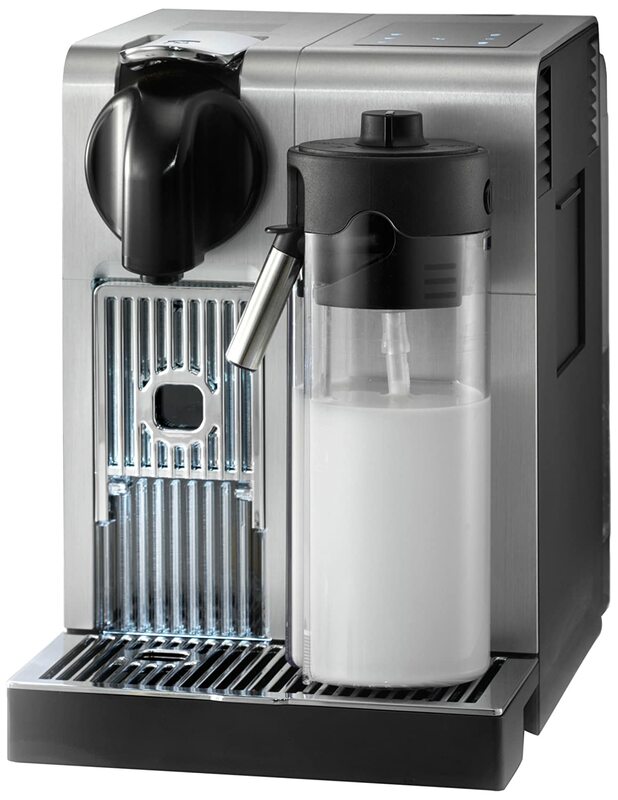 Although this machine does not include a built-in milk frother, you can buy a separate frother like Nespresso Aeroccino to make cappuccinos and macchiatos out of the lungo shots you get from this machine. If you like a real tasting espresso at home but you don't want all the mess that comes with most at-home espresso machines, check out the Pixie. Cleaning this machine is super fast and easy because the used Nespresso k-cups pop down to their storage container so that you get rid of them easily. It's recommended to descale this machine at least once every six months or if you start to taste calcium in your coffee. Follow the instructions in your manual to descale. The taste of this coffee is unique, delicious and aromatic even compared with coffee from other coffee machines, as well as coffee from various cafes. With this coffee maker, you will forget that you spend lots of money at coffee shops, even though the capsules are not that cheap. Nespresso Vertuo also comes with Aeroccino, which makes it easier to make a cappuccino or a latte; one-touch button and go, a creamy blend or whipped froth is ready depending on your preferences. The machine works the exact way it is advertised and produces a very creamy coffee even without the milk froth added. This machine comes with a sample pack of 8 Nespresso capsules and not 16 like the other machines. It's important to note that these capsules are of a different shape than the k-cups used in the previous machines. So they are meant to be used only for this line of Nespresso machines. The tray of this machine is a little bit different compared to trays in other machines. It has a single removable metal plate that can be moved up in order to allow you to use smaller espresso cups. That's a cool little feature that I like. The tray is still removable so that you can clean it easily. Although there is enough room for tall cups, you can use even longer cups when the tray is detached. The place to drop your capsules for extraction is shown by moving the metallic lever on top to the left direction which is different from all the previous models. When the button on top is glowing solid white, the machine is ready to start the extraction. You just have to move the lever to the right and the machine will go into the extraction mode. The used capsules container is attached to the side of the machine and holds up to 14 spent capsules. A 40 Ounces water tank without a filter is attached to the other side of the machine. This machine takes about 15 to 20 seconds to heat up before brewing. What's really interesting about this model is that Nespresso has introduced a new capsule type which allows you to brew both espresso and coffee, all in one machine! That was a WOW moment for me when I discovered! I consider this as one of my beloved Nespresso machine reviews just because of this feature. The newly shaped espresso capsules yield about 8 grams of espresso while the coffee capsules yield about 13 grams. The regular Nespresso k-cups yield about 7 espresso grams. This machine utilizes a new centrifugation technology which means that the new circular capsules are actually going to spin while getting brewed. Nespresso has been bragging about the crema produced from the vertuoline machine due to the centrifugation technique and I have to admit, they should! No other machine reviewed above matches the layer of crema I obtain from this Nespress overtuoline machine. Another very innovative feature in the new capsule is that it has a bar code on its edge which is read by the machine; this bar code is going to inform the machine exactly how much water it should run through the capsule in order to brew you cup of coffee. The coffee produced by the best Nespresso machine also surprises the consumers with its deep aroma, which makes your imagination wander to the warm and cozy cafes in Italy. 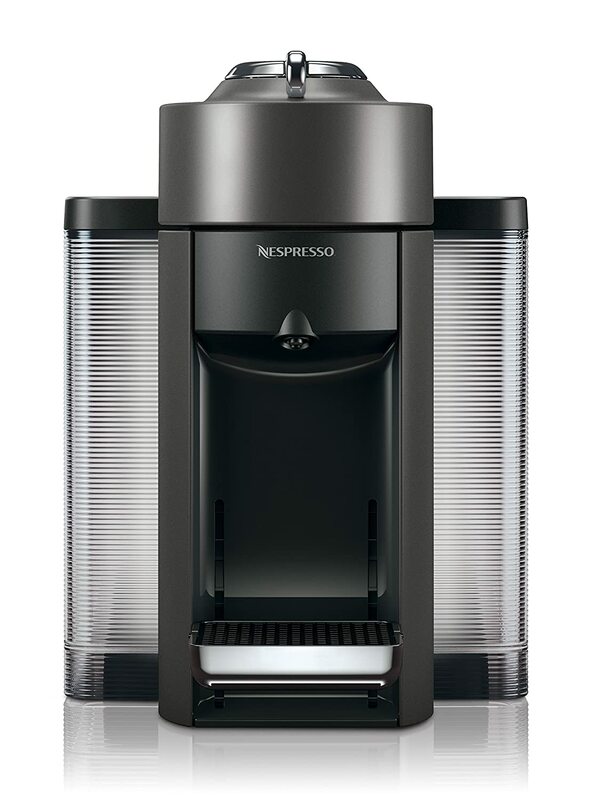 For those who don't know, the Nespresso Vertuoline is known for making both coffee and espresso obviously trying to compete with the Keurig market. The package includes a sample of 12 Nespresso capsules, both espresso and coffee. I enjoy the design and particularly like the red as it gives a bit of color to a gray and white kitchen. 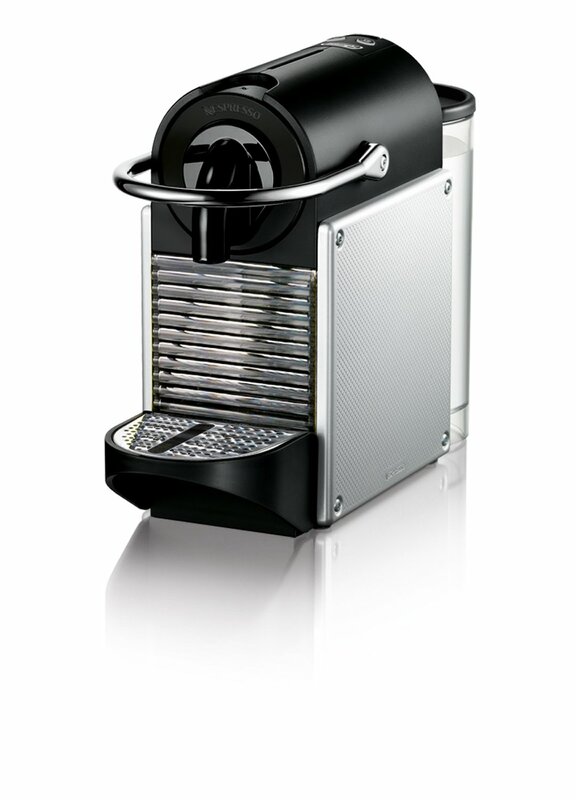 The design alone makes this machine worth mentioning in my Nespresso machine reviews manual. The machine is not larger than any of your typical coffee pod single serve machine. The first thing that I recommend to do when you operate the machine is to run through the cleaning cycle which takes about 5 minutes. Once the cleaning cycle runs, you're ready to start brewing. It's pretty simple like the previous machine, you just put the coffee pod in, close the hatch, and lock it in place. After pressing the button, your coffee will start pouring in about 15 seconds. The Vertuoline is smart enough to know what type of capsule you put in and in return, adjust the cup size based on it which I really liked. The temperature of the coffee produced by this machine is around 140 to 150 degrees Fahrenheit which many coffee lovers will enjoy. 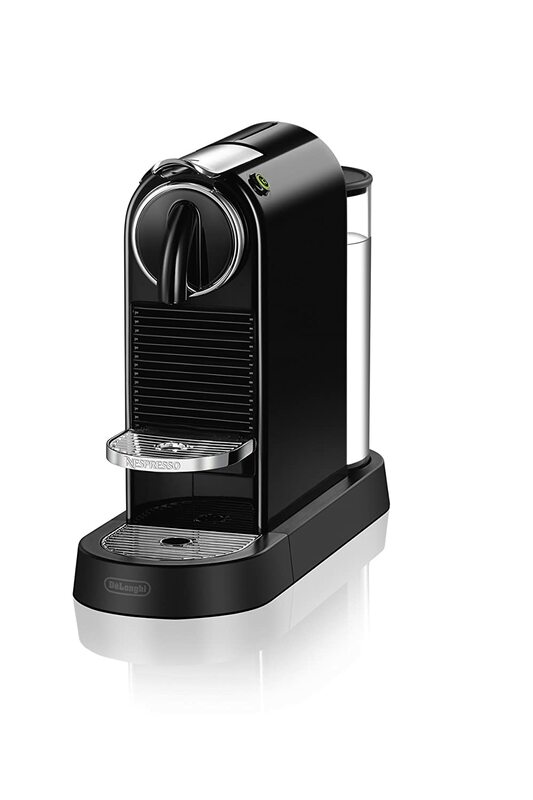 The main advantage of this Nespresso Vertuo Evoluo is the large water tank of 54 ounces. It has more options for cup sizes, which distinguishes this coffee maker from compact Nespresso coffee makers mentioned earlier. I really love the fact that you can also use it to make your favorite iced coffee drinks, an option not found on most of the other machines. 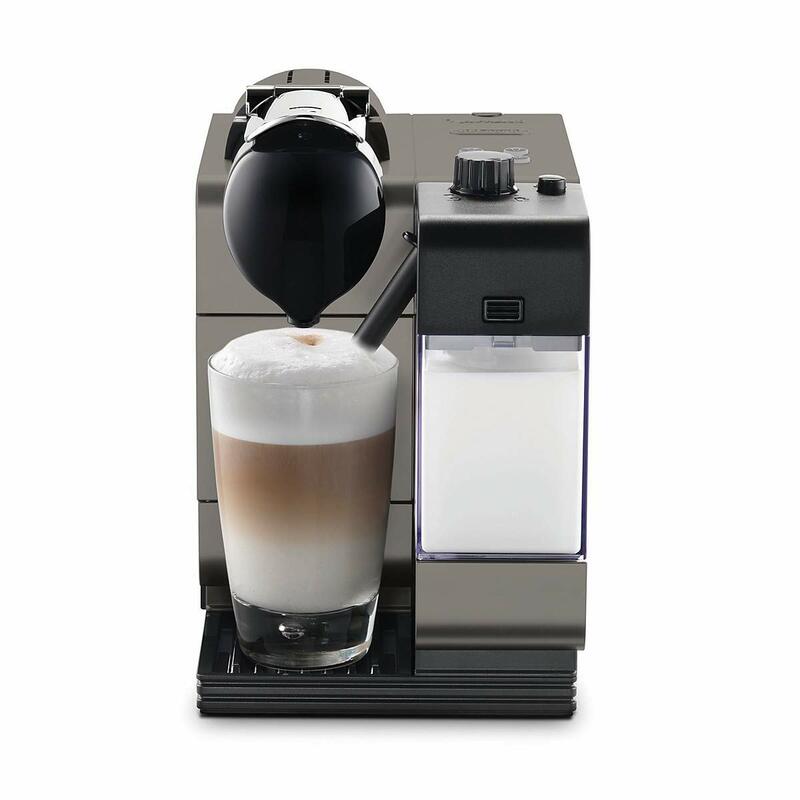 This machine makes such delicious frothy coffee and you can always choose the one to your taste out of the large variety of capsules produced by Nespresso. One of the advantages, which should be mentioned, is that there is a complementary set of capsules. It gives you an opportunity to sample some of the Nespresso blends and choose your favorite ones to buy later. One drawback of this coffee maker is that it's significantly louder than others in its line. Another con is that it's a premium product which means you will be paying premium prices for the coffee pods at around a $1.10 each. Moreover, the coffee pods are not as easily found as k-cups are. Something strange to note about this machine is that its price differs by color with red being the least expensive. Despite the above things, I find this machine to be a great product or a gift idea for the coffee lover in your life or someone who is looking for that next piece of tech for their kitchen. 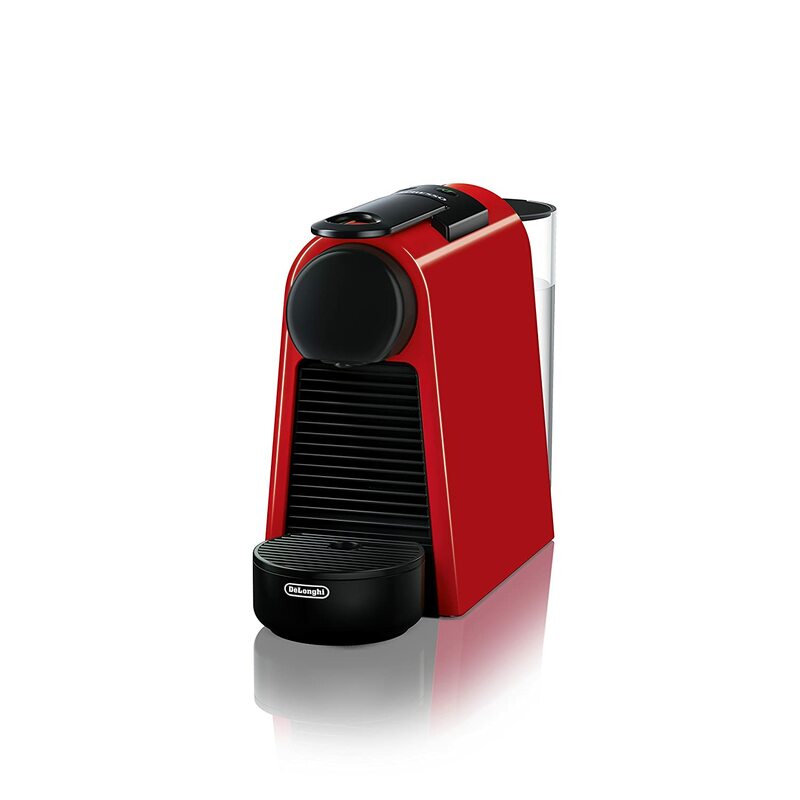 Nespresso CitiZ is yet another single serve automatic espresso machine that makes hot and ready to go espresso cups. It's a perfect morning coffee maker; you just need to put in a capsule in the brew basket, press a button, and drink your favorite cup of coffee. The design of the coffee machine and its dimensions allow it to fit well into both a strict office style and a democratic kitchen interior. The water tank on this machine is about 34 Ounces. It has two buttons, one for lungo (double shots) and the other for regular espresso single shots. The package includes the usual sample pack of 16 different Nespresso flavor profiles. The size of the cup is programmable like what I have shown you in the previous machines. The machine is very quiet yet very fast. You just wait few seconds to heat up. The used capsules basket holds about 10 used Nespresso capsules, slightly lower than other models. These capsules are quite expensive, but as they say "you have to pay for the pleasure". Well, the main advantage of this miracle unit is that it is simply created to give pleasure in each cup of aromatic coffee with thick froth. The Nespresso company relies on two things - the exceptional quality of the coffee itself and the maximum improvement of the way the product enters the cup in the form of a drink. The main technological know-how of the company is specially designed aluminum coffee capsules, the use of which is carried out with the help of branded coffee machines. This combination provides guaranteed quality and excellent taste characteristics of the product. The principle of operation of such coffee makers is based on the transmission of hot water under high pressure through a coffee capsule containing natural coffee - roasted, ground, and pressed. Therefore, the preparation of the drink takes so little time: you just put the capsule inside the device, substitute a mug, and press the button. The company creates all options for those who are planning to buy coffee machines, allowing you to purchase the most suitable solution for your particular needs. I hope that the Nespresso machine reviews above have helped you decide the best Nespresso machine to buy based on your needs and budget.